No access yet? Make sure to recommend Advanced Healthcare Materials to your librarian. More information can be found here. 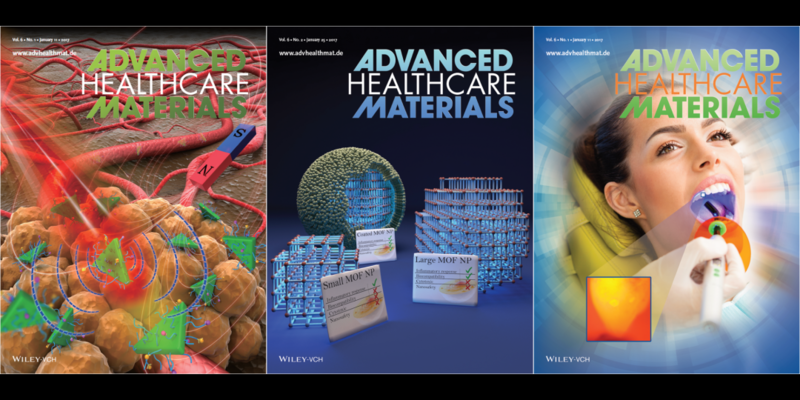 In this monthly feature, we highlight the artwork on the covers of both issues of Advanced Healthcare Materials, and of course the research behind it. You can find this month’s issues here and here. Click on the headers below to get to the corresponding papers. Multimodal nanoprobes can play an important role in early diagnosis and personalized treatment of cancer, allowing to take advantage of the complementary information obtained by multiple imaging techniques while enhancing the contrast and sensitivity of each. A group of Chinese scientists led by Zhen Yuan at the University of Macau and Hairong Zheng at the Chinese Academy of Sciences in Shenzhen have constructed copper sulfide nanotriangles, modified with proteins and then functionalized with DTPA-Gd3+. These biocompatible nanotriangles prove to be efficient contrast agents for photoacoustic as well as magnetic resonance imaging, highlighting the power of this simple but elegant water-based method. 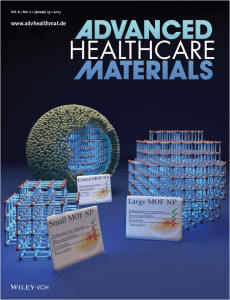 Metal-organic frameworks are a promising platform for the synthesis of porous nanoparticles for diverse medical applications. 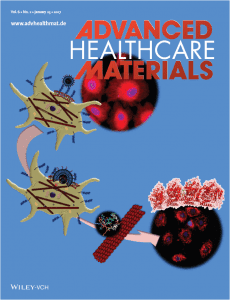 In this study, Silke Meiners, Stefan Wuttke and their collaborators from institutes in Hannover and Munich comprehensively investigate the nanosafety and the related suitability of metal-organic framework nanoparticles for medical applications, including drug delivery and implant coatings. 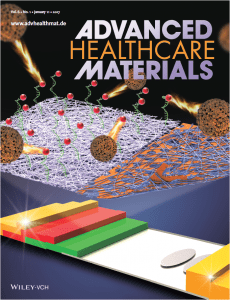 Their findings underline the importance of early evaluation of each new metal-organic framework nanomaterial for specific medical applications. 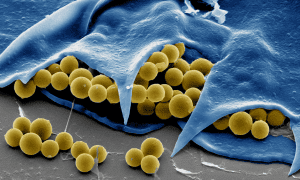 Lateral flow assays for point-of-care detection of viral infections can now benefit from hybrid materials. 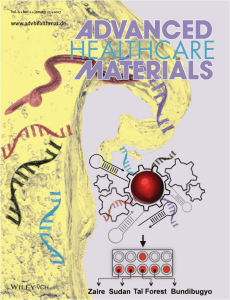 Feng Xu, Belinda Pingguan-Murphy and their co-workers from universities in Xi’an, China and Kuala Lumpur, Malaysia demonstrate an approach to combine the advantages of an agarose hydrogel and paper into a hybrid substrate. Incorporation of this material into lateral flow assays realizes a better control over the fluid flow and biomolecule interaction, thereby resulting in substantial signal enhancement for the detection of the dengue virus. 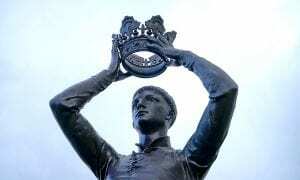 A more extensive news article about this study can be found here. Cancer currently often is treated with non-specific chemotherapeutic inhibitors with poor water solubility, resulting in severe side effects for the patient. A group of Indian researchers led by Surajit Ghosh at the CSIR-Indian Institute of Chemical Biology in Kolkata has created oligonucleotide aptamer-conjugated liposomes to specifically target breast cancer cells, containing nano-assemblies of docetaxel, a common anti-cancer drug, and a peptide to target and disrupt the microtubule networks inside these cells. This “dual warhead” approach indeed leads to very promising results with minimal toxicity. For more than 50 years, dentists have used a traditional mirror and probe (“dental explorer”) method to detect caries, worldwide the most common disease affecting approximately 36% of the world’s population. 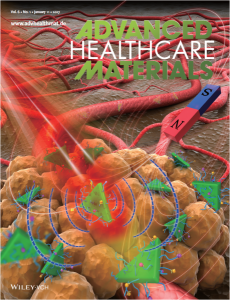 Addressing this technological gap, a team led by Advanced Healthcare Materials board member Joerg Lahann at the University of Michigan has developed an alternative method based on positively charged starch nanoparticles labeled with a fluorophore. 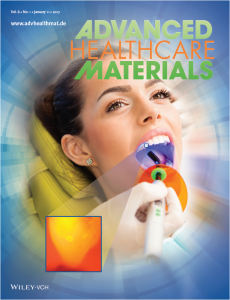 Due to their charge, these edible particles selectively stain active carious lesions, but not the healthy tooth surface, thereby in potential revolutionizing early-stage diagnosis of dental caries. 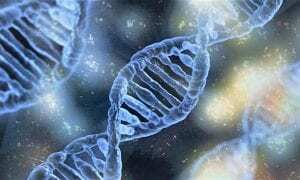 Early diagnosis of Ebola may halt the transmission and increase the probability of survival, and help controlling the spread of this viral disease. A research group led by Mehmet Yigit from the University at Albany has developed a highly programmable, cost-efficient and multi-analyte sensing approach that enables the visual detection and differentiation of the conserved oligonucleotide regions of all Ebola virus subtypes known to infect human primates. This innovative method offers practical opportunities for point-of-care diagnosis of infectious diseases in resource-limited settings. As the population is aging and progressively more obese, more patients are expected to suffer from chronic diabetic ulcers in the future. 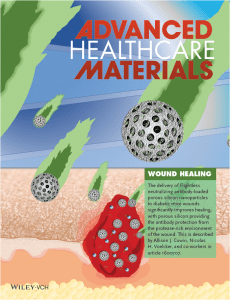 A team of Australian scientists led by Nicolas Voelcker and Allison Cowin at the University of South Australia in Adelaide have loaded porous silicon nanoparticles with the Flightless I neutralizing antibody, known to improve wound closure and scar appearance, to protect the drug from rapid degradation in the harsh acidic wound environment. Indeed, this non-toxic drug delivery system slowly releases the antibody over multiple days, thereby significantly enhancing the healing process, and may be effective for other chronic wound treatments as well.